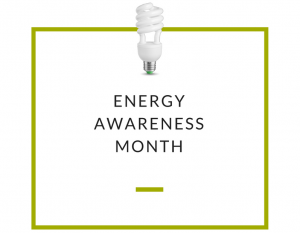 October is Energy Awareness Month, but energy conscious habits can be applied all year long. Use power strips – When you plug multiple items into a power strip it becomes easier to manage their use. You can cut power to the electronics with the flip of a switch instead of manually unplugging each device. Keep lamps and TVs away from your thermostat – Your air conditioner may run longer than it needs to if these items are located near your thermostat since they emit heat. Use a programmable thermostat – According to the U.S. Department of Energy, you can save an estimated 10% each year on heating and cooling costs by using a programmable thermostat like the one featured in our Comfort Connect PlanSM. Take shorter, cooler showers – Adjust the water temperature and length of your shower to save energy. Seal gaps – Whether you’re trying to keep your home warm or cool, the comfort can leak through gaps in windows and doors. Caulk window and apply weather-strips and you could save up to 20% on your heating bill this fall and winter. Replace your HVAC filter – Dirty filters can push dirty air and allergens into your home and reduces air flow. Reduced air flow means your unit has to work harder to deliver the air to your home. When it works harder, your energy bills increase. In addition to a potentially high energy bill, the HVAC unit could malfunction and fail. It’s recommended to change your filter every one to three months (depending on the quality of the filter, how many people live in the home, and if you have pets) to help avoid these issues. We’ve shared seven tips with you, but there are even more ways to save on energy year-round! Like us on Facebook where we’ll share more tips throughout the year! AEP Energy is a certified Competitive Retail Electric Service (CRES) provider and as a Competitive Retail Natural Gas Service (CRNGS) provider. While it is an affiliate of AEP Ohio, AEP Energy is not soliciting on behalf of and is not an agent of AEP Ohio. AEP Ohio customers do not need to purchase any competitive retail electric service from AEP Energy to receive or to continue to receive non-competitive retail electric services from AEP Ohio.